It's been too long since my last post. My computer shot craps, and it's so hard to type all I want to type from my phone, so I waited. Sorry for the delay. Boy do I have some interesting things to talk about. On August 17, 2016, I went to the Swedish Medical Center in Seattle to see Dr. James Bowen at the Multiple Sclerosis Center. My local neurologist, Dr. Kosa, was pushing me to see him since this center specializes solely on MS. Dr. Kosa thought it would be in my best interest to have a back-up plan in case HSCT didn't work for me. I've got to say that I'm so glad we decided to go. Dr. Bowen is a huge proponent of stem cell transplant for MS. He told me there were 3 types of stem cell treatments going on for MS patients right now. We asked him which procedure he would've opted for if he had MS, to which he said BEAM. With that said, he told me that their facility requires $450,000 for the deposit. The procedure itself usually ends up being $150,000, so you get a chunk of the money back. For us, asking for $450,000 is about the same as asking for 1 BILLION dollars. There is no way I could get that kind of money. 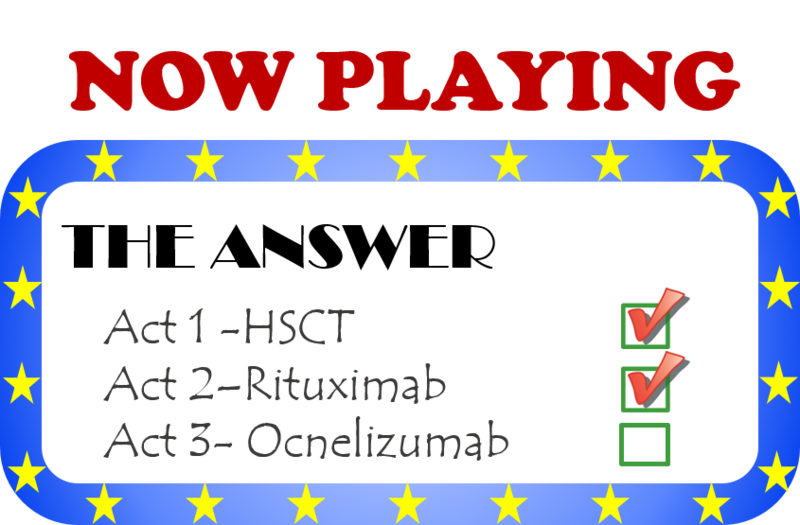 So with BEAM not even being an option, we focused the rest of the conversation on HSCT and what that meant to us. He said that he liked HSCT and was familiar with the Mexican protocol. The problem with HSCT in his opinion is that you are not sure how long it will last. It is possible for it to hold MS at bay indefinitely, but not always. We told him that we were staying on plan with the Rituximab follow-ups every other month for a year. This is where it got very interesting. He said there is a new drug that is going through final FDA approvals (he's estimating November) that is for MS patients. It's called Ocnelizumab. He stated it was similar to Rituximab, but completely human based. Rituximab is part human, part mouse and that is why people get the negative reactions (ie - throat closing, itching, hives, etc). 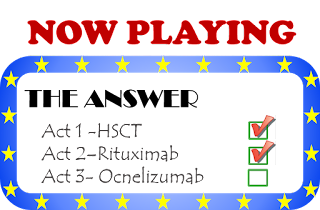 Ocnelizumab, like Rituximab goes after the radical B cells that cause MS flare-ups. He said that my plan should be to get a monthly CD19 blood test and if it is positive get an Ocnelizumab infusion. CD19 is a B Cell marker that they know is a bad deal for people with MS. I asked the question - So, I shouldn't have ANY B-Cells? The answer was - If you have any B Cells, you need to get the infusion. Scott asked if the infusion would keep the MS controlled, and Dr. Bowen said it could - indefinitely. So, we have a plan. This was very encouraging! I loved hearing the word INDEFINITELY!! We talked about Myelin repairing options. The biggest one in trial now is ANTI-LINGO-1. He said they had seen good results with eye issues, but still very unknown about other MS issues. He thought this was because they had a good way to measure eye improvements, where as other issues are harder to measure. There is no timeline set on FDA approvals. On the same note of approvals, I asked if he thought stem cell transplant for MS would get approved so insurance would cover it. In his opinion, he didn't see this happening. He said - insurance companies have their drugs, why would they push for it? I had my 3rd dose of Rituximab on Aug 22. I was joined by my fellow warrior Deb Lee and her husband Joel. It was great seeing them. I had purchased the Hydrocortisone in Mexico to go alongside the Rituximab, so I didn't have any issues there. As for improvements, I feel about the same as the last post. Still having cognitive issues, some heat intolerance, walking issues after a while, fatigue. With that said - if we've stopped this beast, I will be ok. I feel blessed to have had this opportunity. I hope this information has helped and look forward to talking to others about their progress. Oh - final update. I asked Dr. Bowen if it's okay to do HSCT again if needed. He said yes - it would not be an issue to have it multiple times.